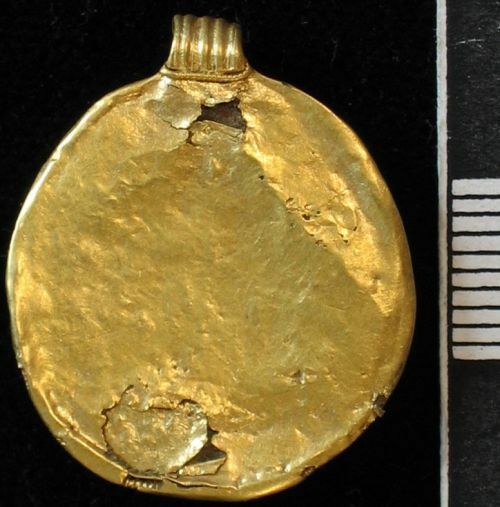 Early Saxon gold and glass oval pendant. Very thin gold sheet back-plate, now with slight damage. The setting is formed from plain gold sheet with a single beaded wire collar where it joins the back-plate. A separate ribbed gold sheet suspension loop has a loop of beaded wire around the base, the ends of which are tucked inside the loop, hiding the join to the back-plate. 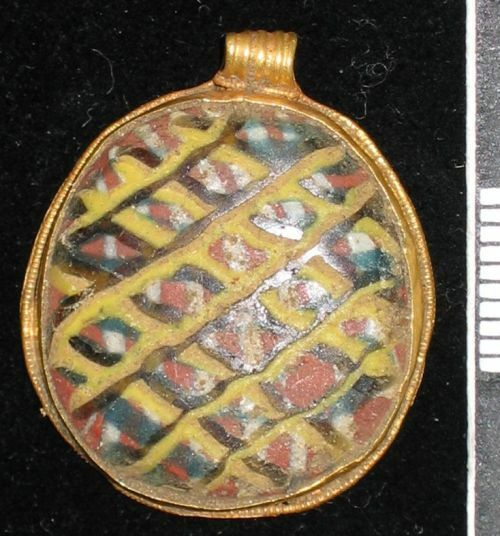 The glass is Roman mosaic glass with pink and white forming curved vertical lines, overlaid with green curved transverse lines and yellow and black lines forming a lattice overall. A similar mid 7th century example was found at North Downs, Kent (Treasure Annual Report 2003, 214, fig.94.1, right). See also 2007 T78, silver and glass setting from 'Tuxford area', Nottinghamshire and Geake 1997, 39-41. Length (including suspension loop) 27mm, width 22mm. Weight 3.90g. The age and precious metal content of this item therefore qualify it as treasure under the stipulations of the Treasure Act 1996.